The Poptart Manifesto by Rick Gualtieri: Are Writers Their Own Worst Enemy? This had originally started life as a discussion primarily around self-published authors. However, I realized it probably applies to any and all writers: big or small; self, indie, or traditionally published. Today, writers have more power than ever before because they have more choice than ever before. There's a downside to this, though. The old saying "give a man enough rope and he'll hang himself" comes to mind. It wasn't too long ago that the death knell was sounded for the big six traditional publishers. People cited them on their seemingly archaic business models, their attempts at stifling new technologies, and their unfair treatment of authors. With the Department of Justice's price fixing lawsuit, blogs like JA Konrath's declared (and continue to) that the writing was on the wall for their obituaries. With the rise of Amazon's Kindle Program, Pubit for Barnes and Nobles, and others, there was a new economy on the rise. Aspiring writers could bypass the gatekeepers and reach a massive audience, all while reaping unheard of royalty rates. However, it may be that the big six aren't going anywhere. It may be that their best strategy against this upstart new business model is to sit back and do nothing save make a bowl of popcorn and watch all the writers who seem determined to shoot themselves in the foot. Indeed this has not been a kind summer for self-publishers or the writing world in general. If the self-publishing world were to be condensed into a person, they'd definitely still be scrappy, but would certainly now be sporting a pair of black eyes thanks to the actions of a few. Many major media outlets have been running with a story regarding paid reviews on Amazon. John Locke, the poster boy for self-publishing success, had admitted to doing this. This has polarized the writing community between those who say it's wrong and those who shrug their shoulders and claim that it's necessary to succeed. The end result, though, seems to be pointing toward a general suspicion for all reviews now. 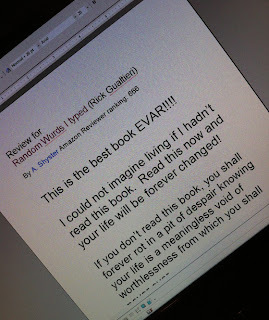 Author Carroll Bryant posted a list of blogs he felt had cheated him out of reviews. The entire situation then quickly spiraled out of control into a tale of outright stalking. UK writer, RJ Ellory, was recently exposed for writing self-reviews as well as panning his competition, leading to what some are calling a questionable apology. At the top of the infamous list has been the Stop the Goodreads Bullies website (no link, sorry. I have no interest in sending them traffic), which went so far as to list personal information for previously anonymous reviewers. - Why should we have to accept this? - Why should we tolerate bad behavior just because previous generations did? - Why can't we try to be better than that? Everyone wants to succeed. That's not a new thing. Ultimately, though, only a few of us are going to be able to scale that mountain and even less will be able to remain atop it. Consider this, though: If you're a new writer what will such behavior gain you? Maybe a few sales, maybe even a little ego gratification. But how long will it last? If you're just here to make a quick buck, you probably don't care (and you're probably not reading this anyway). However, if you're truly looking to make a name for yourself, how long do you think it'll be before your behavior is uncovered? The internet has a long memory and it's like a bulldog if it suspects wrong doing. Is it really worth tarnishing yourself from the start, jeopardizing what you hope to be a career, all because you didn't have the patience to aim for the long term? If you're an established writer with a large fan base, that's a wonderful thing. However, if you've used questionable tactics to get there, how will that reflect upon you? Sure you might be laughing all the way to the bank, but whatever legacy you hope to have could suffer for it. Do you want to be remembered 50 years from now for your works or because you were part of a scandal? I can't help but think that all of these events happening in such a compressed time frame will have / are having a cumulative effect on the entire industry...which should be a concern for all of us (writers). Already I've seen several blogs either shuttering their windows or becoming a lot more selective about who they review. It's one thing if a person wants to commit career suicide, but I'd wager that their actions harm us all. I'm not saying everyone has to be squeaky clean or saint-like at all times. I'm not that naive. We're all human. That being said, it would behoove us all to think things through before we act and consider the consequences...to try and act with a little integrity and professionalism. If enough of us take a stand and try to take the high road against this behavior, we can steer this industry back on the right track and help ensure that when the day comes that the news decides to run a story on one of us, they'll put the focus on what we all want them to: our books. This reminds me of just about any industry where there is a lot of competition and rivalry. It's not different from support bands complaining that headliners stole or broke their equipment, or sports team accusing others of cheating. It's all the same lack of ethics or desire to cut corners. Nothing new. And to think I am annoyed because Lulu wiped out my real reviews because we went in and fixed typos, therefore releasing a new version that erased the previous history. Who knew I could just invent them anyway? As a reader, and reviewer... I have to say that this stinks. It is wrong and I hate it. But I also have to say that this is what is happening everywhere. I worked in a school.. how can that have anything to do do with this, you wonder? Bad behavior and lies by omission. Places where friends worked and work now... same thing. Lying, cheating and generally behaving badly. The only thing you can do.. or any of us can do, IMO is to be the best person we can be, individually. Try to tip the balance back to honor and empathy. If we cant we are in a lot of trouble. I'm afraid that considering good vs bad, we are in trouble. It's unfortunate that some people are resorting to gaming the review system and behaving in such appalling ways. But I don't think it reflects on the larger community of self-publishers. Some of the most gracious and admirable people I've ever met online are self-published authors. As you mentioned, writers now have more power than ever before to find their own audience. They can just as easily sabotage their own reputations, but as individuals, we don't have to be overly concerned about the behavior of others reflecting on our credibility. Yep. Happens in every industry. Doesn't make me happy, though...especially when I see people rewarded for it. Glad you enjoyed it, but I get what you're saying. It's a definite crap shoot out there. Agreed on that, Ford. I've net a ton of awesome people in the past year. I'm of the mindset that the bad apples are a small bunch. Sadly, they're a vocal minority, and I think they're painting the rest of us in a bad light...which makes it even more important to stay on as much of the up and up as we can. I think we have to be careful about the people with whom we work. I feel very comfortable with Wayman Publishing, and I'm willing to edit for some other authors I feel I know. I believe these people will take the highroad. If not, then f$#* them, and I'll add a for shame. The entire incident of Stephen Leather shocked me. Here's an established guy admitting to creating fake reviews and accounts to create a 'buzz'! To me, I write because I want to. I don't depend on it for my living-- which makes taking the high road easy. But even if writing fiction were my sole source of income, I don't think I'd try gaming the system-- just like I would never try to shoplift or embezzle or forge in real life. Ethics are important, whether in life or in fiction writing, and some people seem to be forgetting that. Right on, Rick. I'm doing my best to behave with integrity online and off. Can't say I'll get it right 100% of the time, but I strive. Glad to see other writers out there feel the same way. Same. I've been exposed to Wayman through Elisa, which is enough to give me a good feeling about them. Exactly, Damyanti. I was raised a certain way and I'm trying to raise my kids that way. Maybe that makes me a lousy businessman, but at least I can sleep at night. Awesome, Mina. I think intent is everything. There are always bumps in the road, but there's a big difference between an accidental stumble and actively gaming the system. The long answer: Hell yes. It's really sad what people will do. My friend was published through a vanity house and I recently found out they're "requiring" all of their authors to review every single book published through them. She got dozens of reviews immediately after the publication date. It looks good for her, and I have to admit, it made me envious/sad because I've worked so hard for honest reviews. Oh well, at least I know that I've done everything I can to succeed honestly and that's something to be proud of. P.S. I'm so glad I started Wayman. It's been A TON of work, but one of the best things I've ever done. It definitely is. I look at it this way, even if I never make it all the way...whatever success I do have, I'll know I'll have earned doing things on the up an up. ps: Hah! I actually had no idea you started Wayman. Learn something new every day, I guess. Good for you! That makes what you've done that much more impressive. Hi Rick, great post. I've found that a person lacking in integrity usually lacks it in everything they touch; their family, their business, their friendships. It's hard to reason with greed and low life visionaries, so I don't bother. I hold myself to a high standard and expect the same from my peers. When I don't get it, I assume they are NOT my peers, but just another want-to-be destined to never have more than 15 minutes of fame. Writers are a different breed. And like other occupations, we harbor the good, the bad and the ugly. It's up to us to choose which of these we want to be. It's easy to spot the pretenders from where they stand. Class and dignity shine much brighter than cheats. To that I say, Amen.